Once you have identified someone that you think the task could be delegated to, you should establish whether or not their present workload would allow them to take it on. If so, you will need to specify the delegated task and agree the level of support that will be required. These tips are taken from our eBook ‘Successful Delegation‘ which you can download for you PC, Mac, laptop, Kindle or eReader. Managers often express their instructions in vague terms like handle, coordinate and liaise. For example, “Id like you to handle our relationship with them from now on”. This leaves too much room for misinterpretation and the criteria for a successful outcome have not been specified. In a recent survey, over 60% of staff claimed to be unclear about what was expected from them or how their performance was to be measured. When delegating, it is important, where possible, to specify the objectives clearly against measurable criteria. This includes the specific outcome that is required and the standard that is expected. People need to decide how to use the authority that has been delegated to them. Having stated the objective, your team member should be allowed to perform tasks in a way that suits their own personality and way of working. If the team member encounters any problems, you will need to suggest some solutions and leave it to them to choose which to implement. You should always leave the choice and authority with the team member, if you take control back, it could make them feel resentful or inadequate. You will need to be clear about what resources, in terms of your own time, will be needed. This means that you can plan your own involvement and will not sub-consciously view their requests for help and advice as an inconvenience. There are two common reasons why people reject responsibility for a task they have been delegated. Firstly, they may feel that they have been given a task that should not be their responsibility. Secondly they may believe that their manager is interfering in the details of the task, and not allowing them to use their initiative. Managers need to overcome both of these obstacles, by selling the benefit of doing the task and leaving the team member room to show initiative regarding how the task is to be done. The responsibility for the delegated task is still ultimately yours and you will need to find unobtrusive ways of monitoring progress. It is important that you are not seen to be interfering or directing the delegated work. It is in the nature of most people to over-report the progress that they are making and to underestimate how much time and effort is required to finish a job. This is because people are often naturally optimistic and feel that they will be able to make up lost time. Feedback is a major factor in motivation and should be given periodically, while the work is carried out. Effective feedback is more than just letting people know that something has gone wrong. It also empowers people because it enables them to build on their successes and lets them know that their efforts are appreciated. This should improve their performance and enable them to keep their problems and concerns in perspective. You need to say what you really think in the most objective terms possible. If you show you recognize and value their efforts, people are far more likely to act on any suggestions that you make. Constructive feedback should also be as specific as possible, stating which aspects of the task were completed well or badly and, if possible, feedback should be given while there is still time to act on it. Most people are prepared to take on responsibility in exchange for recognition. It is important that people are thanked for their efforts and that those efforts are recognized, for example, in performance reviews. Recognition need not always be formal; it can take the form of names mentioned in memos or departmental meetings. Because you are still accountable for the tasks you delegate, you need to find out whether the agreed objectives have been met, to the agreed standard, within budget and on time. Was the objective adequately specified? If there were significant omissions or unnecessary detail in certain areas, then this may be because the objective was not stated in sufficient detail. Was the team member given enough support? Did you schedule sufficient time to support the team member? Did you brief the team member on the importance of seeking advice as and when they needed it? You should remember that some people are reluctant to ask for help because they feel that this shows a lack of ability. Was the team member given sufficient time? There is a learning curve associated with every new activity and you should allow extra time to accommodate this. Did the team member have the necessary skills? It may be that you misjudged the existing abilities of the team member and this may point to a training requirement. These questions should together answer whether or not your expectations were realistic. 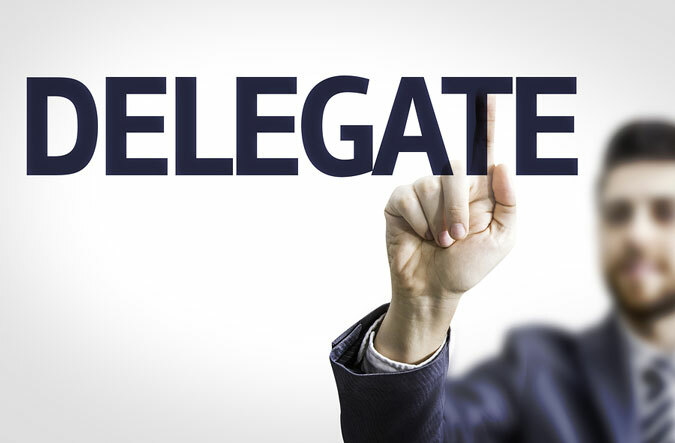 Evaluating the outcome of delegation in this way will enable you to make better judgments in the future. When delegating work you should provide: a clear brief as to what the job entails, guidance about when they should refer back to you, opportunities for them to use their initiative and support, as and when required. You should be aware that progress tends to be over-reported and that you retain the ultimate responsibility for task delivery. As well as giving ongoing feedback you should evaluate the outcome and apply any lessons learned when delegating work in the future.